While dandelions are likely less than welcome on your lawn during the warmer months, they should be more than welcome on your plate. Their leafy greens offer a bitter, peppery flavor that works well raw or cooked. They're low in calories -- each 2-cup serving contains just 50 calories -- and come packed with vitamins and other nutrients important for good health. Add dandelions to your diet to reap the health benefits of their impressive nutrient content. Dandelion greens come loaded with lutein and zeaxanthin, two nutrients important for healthy eyesight. 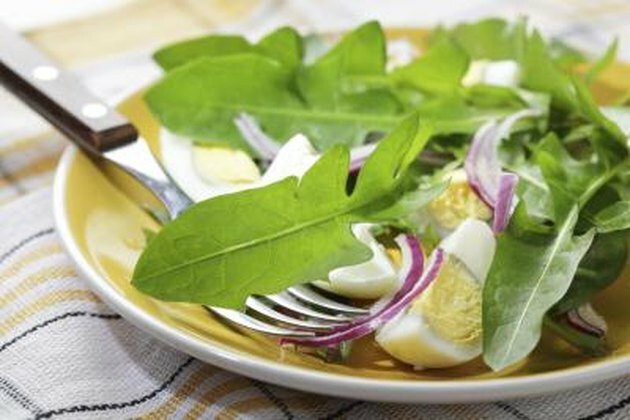 Two cups of dandelion greens -- a serving size that counts as 1 cup of vegetables, under U.S. Department of Agriculture dietary guidelines -- provide 15 milligrams of lutein and zeaxanthin. Both nutrients filter light as it enters your eyes to protect eye tissues from light-induced damage. Consuming at least 12 milligrams combined of lutein and zeaxanthin daily lowers your risk of cataracts and age-related macular degeneration, according to the American Optometric Association. Incorporate dandelion greens into your diet as an excellent source of vitamin C, as well as a vegetarian-friendly source of calcium. Vitamin C and calcium both positively affect your bones -- you need calcium to maintain bone density and rely on vitamin C to produce collagen, which makes your bones resistant to damage. Both nutrients also support nerve cell communication and contribute to nervous system function. A serving of dandelion greens provides 206 milligrams of calcium, or 21 percent of the recommended daily intake for most adults, according to the Institute of Medicine. Each serving also contains 39 milligrams of vitamin C -- 43 percent and 52 percent of the recommended daily intakes for men and women, respectively. Raw dandelion greens' bitter taste might take some getting used to, but cooking the greens mellows their flavor. Try sauteing them in low-sodium broth along with diced onions or minced garlic, or steam them for a healthful side dish. Alternatively, mix chopped dandelion greens with other leafy greens -- such as spinach or romaine lettuce -- for a flavorful and nutrient-dense salad. Add a handful of greens to your favorite soup, or use a few dandelion leaves in a sandwich or wrap for flavor.